They work well when new; good fit, good traction. But they soon loose/break studs & the wire coils break. The rubber gave out on one after about 200 miles. I run on park trails that are mostly snow & ice covered, but with bare sections of pavement as well. the bare stuff really kills these. i'm going to try another brand. I held off on reviewing these until they were worn out. 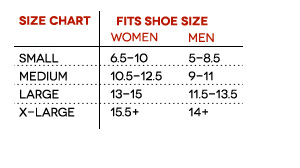 The fit on the shoe is good; snug, no lumpy feeling underfoot. Traction is much improved. They were great for the first 40 or 50 miles. Then 1 stud broke off & the wire coils started to break. I continued to use them until on of the rubber bands on the bottom broke & it wouldn't stay on the shoe anymore. At that point a couple more of the studs were broken, worn out or shifted in the rubber to the point where they weren't effective. The wire coils were also broken in multiple places. Total mileage: about 200 miles. Not so good. If you run on nothing but snow & ice, they'll last a lot longer, but any bare pavement at all just kills them. I won't buy these again but I'll try another brand & see how they work out. I wore these for the first time today on snowy trails. The grip was excellent and I could jog with confidence knowing I would avoid slipping. Now I can really look forward to future winters runs on trails! They will be great for Nordic pole walking as well. I've only used the YakTrax a couple of times so far, but I have tried them on ice and compacted snow, and they worked brilliantly, no slipping/sliding and you feel safe to run without concentrating on where your feet are going.